We got a group of 11 moms together, with children ranging in age from newborn to toddler, gave them 16 different baby strollers and asked them to rate each one for quality, ease of use, comfort, and durability. We then did extensive hands-on testing with each stroller and came away with a set of excellent strollers with great features and capabilities at a price point under $200. After our testing we came away with several excellent options. Below we list our top 5 strollers, followed by in-depth reviews of 8 different stroller models. Be sure to also check out our Stroller Buying Guide. For those looking for more feature-rich and stylish strollers, check out our best luxury strollers, and for those with twins or two kids to push around, check out our reviews of the best double strollers. Finally, if you're looking for travel systems that include a stroller and infant car seat, check out our best travel systems. Some of the strollers we reviewed didn't do so well with quality: they had flimsy plastic parts, the canopy cracked or tore easily, or the wheels broke after a few months. Some also weren't so easy to use: folding was difficult or cumbersome, handlebars were at an uncomfortable angle, wheel brakes were hard to use, steering radius wasn't so great, or the recline adjustment was nearly impossible to use. Finally, some of the options just weren't very comfortable, with hard back-rests, poorly positioned foot rests, hard plastic parts along the side where your baby leans while napping, etc. But some of the strollers were truly excellent, and we're excited to tell you all about them. 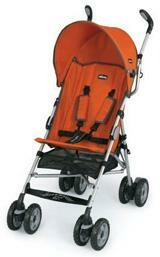 These strollers showed very high quality, durability, ease of use, and comfort. We all loved these strollers, and you don't need to take just our word for it - look online at the ratings and you'll see that these are consistently some of the best strollers on the market for under $200. While you're at it, we suggest considering the awesome Ethan & Emma Stroller Organizer caddy that attaches to any stroller's handlebars and provides convenient access to bottles, cell phone, diapers, wipes, snacks, and anything else you might want off your arm/back and onto the stroller! 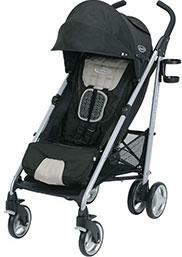 Only about $30, it's a great complement to these strollers! Here are the Best Strollers of 2019! #1. 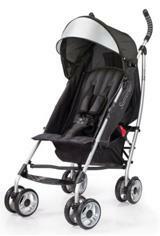 Britax B-Lively 3 Stroller. Britax makes some of the highest quality, safest, and most reliable baby products on the market. The pricing is a bit higher than most other mainstream products, but in our opinion, it's worth the cost. This B-Lively stroller is a great example of the Britax reputation, and the newest version can be had for just about $200, making it the perfect candidate for the #1 spot. Note that at the time of this writing, it was exactly $200, though it typically sells for around $220 or so; if you need to splurge for the extra $15, we totally support that decision! This stroller has a sleek modern design, with the three-wheel aluminum frame, stylish colors, and smooth lines. And those good looks are matched by some serious functionality. In our testing, after we got past our first impressions that this looked like a much more expensive stroller than it was, there were some critical things we really loved. First, we thought the handlebar was very comfortable and allowed a range of hand positions that helped with wrist and forearm comfort over long journeys. Second, we found the seat fabric and cushioning to be very comfortable and supportive, and the "infinite recline" feature (and adjustable head pad) to provide a great position for even the smallest babies. Third, we thought this ride was smooth as butter. It was easy to maneuver around turns and over curbs, helped by its lightweight (about 18 pounds) frame and suspension system on all three wheels. Fourth, we thought it was very simple to do a 1-handed fold and throw into the trunk of the car without any fussing about (folded dimensions are 29" x 23" x 11"). There were also some great little things, such as the peek-a-boo window on top of the canopy that you can use to peer down at your baby, the large storage basket, the single pedal to lock both rear wheels, the canopy's UV 50+ protection factor, and the wide weight range from birth to 55 (!!) pounds. OK, so it's very likely you'll be wheeling around a kid over 40 pounds in a stroller, but it's good to know that Britax over-engineered this stroller, like they do with most of their products. So that's a lot of positive impressions for this stroller, and makes it an excellent top choice for our list of strollers for under $200. Negatives? Not much, but there is no footrest for those interested in one, and the handlebars don't adjust (though we found it completely fine even for taller dads). The B-Lively stroller comes in several different stylish colors. #2. Graco Breaze Click Connect. The Graco Breaze is an excellent stroller, coming in at a close second only to the B-Lively. It has fantastic durability, ease of use, comfort and low price (about $130). Here's the deal: the Breaze is a great, versatile, inexpensive stroller that is easy to fold, and won't frustrate the heck out of you! Graco really outdid themselves with the new Breaze. Yes, it's comfortable and fits children up to 50 lbs., and has a great 5-point harness to keep your child securely in their seat over the bumpiest of roads (and the wildest of kids). It's also convenient, with a cup holder for parents, ergonomic handles, and a *truly* one-handed easy folding/unfolding mechanism. It is an umbrella stroller with the comfort, sturdiness, and many of the features of a large travel stroller. In our testing, we absolutely loved Graco's new one-hand fold mechanism. The canopy is awesome, we measured 26" of coverage, and it's 50SPF UV protective as well. Holds kids up to 50 pounds, so that's like 6-8 years old at a minimum. The seat reclines entirely for easy napping, has a nicely positioned leg rest, and a convenient carrying handle when it's folded up. The storage basket underneath is very easy to access unless the seat is entirely reclined. The only real downfalls we could find were the weight and maneuverability - it comes in a bit hefty for an umbrella stroller, at 20 pounds, and while it's easy to maneuver it doesn't really compare to the smooth-as-butter B-Lively. Overall, for this low price and its extensive feature list, the Graco Breaze stroller is a winner! The stroller comes in a few different colors and patterns; nothing fancy, but good options. #3. Baby Jogger City Tour Stroller. 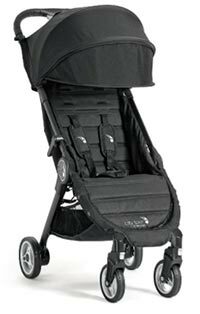 Baby Jogger makes an excellent line of high quality and reasonably priced strollers that suit a wide range of uses. They have the well-rated but large and heavy City Mini and City Mini GT, both of which are three-wheeled strollers above the price-point of this list. The City Tour is a toned-down option, that is highly functional while maintaining a very light weight (about 11 pounds) and easy folding and travel. We like to think of this stroller as perfect for the parents on-the-go, whether traveling by car, train, bus, or plane, this is an excellent companion that won't give you a headache and sore arms! When we received this stroller for testing we were amazed by how small the box was; could this stroller really fold down to a box that was about the size of a small (carry-on) travel suitcase? That was a good start to an overall excellent testing experience! The next thing we noticed is that the stroller is packed into a great travel bag that can also be worn as a backpack, which is a really nice touch and makes it the perfect size for a carry-on bag, fitting right into the overhead bin. The first time we pulled it out the bag and unfolded it, we also realized just how darn easy it was to pop open: release the latch and simply pull up on the handle and expand it out. It does take two hands, but it really is a breeze. And that carry bag you pulled off? The stroller has a little zippered pocket in the back for it, right in front of the storage basket. So, it folds up to a really small size, but when it's opened it's actually a really nicely sized stroller. Our tallest tester is about 6-foot 2-inches, and even he thought the handlebar came up high enough that he wouldn't develop neck and shoulder pain after pushing it for a few hours. Taller or very short parents might have an issue, since the handlebar height is not adjustable. The seat itself is comfortable and well-padded, though we did find it a bit shallow for some kids, and combined with the slightly slick fabric, some tester kids tended to slide forward a bit too much. And the seat back itself is not very tall, so a two-year-old on the taller side was getting close to hitting her head on the canopy. Outside of those small seat concerns, this stroller has some excellent features. We thought the storage basket was a pretty good size for a travel stroller, and that the canopy was really fantastic in its durability and the extension length (plus it has UV 50+ protection from the sun!). Speaking of the canopy, there is an adorable little (closeable) peek-a-boo window up top so parents can look down at their baby. It also has front swivel-wheels (with a tiny bit of suspension!) that can be locked out, a decent (but not lay-flat) reclining seat, and is suggested for use with babies up to 45 pounds. In our testing, the heaviest child was 37 pounds and 4 years old, and that was cutting it really close. He looked like a giant in this stroller, and the lateral stability wasn't really there for such a big kid. So, we suspect you'll use this until around 35 pounds or so. If you have a really chunky monkey, you might want to consider one of Baby Jogger's more substantial strollers, like the City Mini GT that supports up to 65 pounds. Overall, you're getting an excellent stroller here that has a lot of competitive advantages relative to other strollers under the $200 mark, and this one is usually well under that amount. And it's really a fantastic stroller for travel; there are some compromises to be made for such a lightweight and easy to pack up and travel with frame, but that's to be expected. #4. 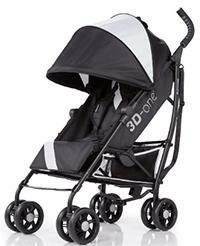 Summer Infant 3D Lite Stroller. 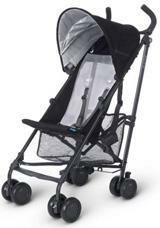 The Summer 3D Lite is an awesome, stylish stroller with a lightweight (only 12 pounds) frame. It has a sleek, curved rear frame that looks really great, and several great color options. It also has a super low 4-position recline that goes way back (almost flat, which is great for naps and diaper changes), comfortable padding and wide seating, fits tall babies (up to 50 pounds), and a large accessible carrying bin on the bottom. It also has an adjustable canopy that blocks 99% of UV rays, but we found that it doesn't come down very far. It's also cheap, coming in somewhere between our cheapest and most expensive options on this list, at about $80-100 depending on color options. We do like the Joovy Groove more than this one overall, in terms of features, durability, and style, but the price point on this stroller is excellent given the bang for the buck. If you can justify the extra $100, then definitely go with the Joovy (below). In terms of negatives, we found that the 3D Lite isn't quite as well made as some of the other options, which according to reviews online, can lead to some issues like broken wheels or locks/levers. We haven't had any issues with it in our 8 months of testing, but it's worth mentioning. Also, we found that when it's reclined all the way back, the baby is exposed to the sun and rain. We also noticed that the folding/unfolding process is a bit more cumbersome than some others, but definitely still very easy. Another negative is that it doesn't stand on its own when folded, which can be a pain. So, some negatives to consider, but in a stylish package with a lot of decent features for the price point. #5. 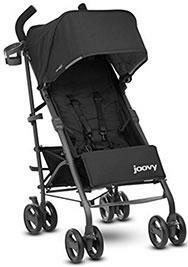 Joovy Groove Ultralight Umbrella Stroller. Coming in at a high spot on our overall best baby strollers list, the Groove Ultralight is, surprise, the lighter weight version of the Groove, coming in around 14 pounds. To be fair, that's not really what we'd consider an ultralight umbrella stroller; the serious ultralight umbrellas (see our review of the best lightweight umbrella strollers) are usually around 10 pounds. A bit pricier than the Graco Breaze, it is usually just under $200. But here's what makes the Joovy stand out: it has a huge adjustable canopy, a comfortable seat with 5-point harness, nearly unlimited recline positions, adjustable leg support, and lots of storage for both the parents and the kid! This is one of the best built strollers on the market, and it comes with a convenient shoulder strap to carry it. It also stands on its own while folded, which is very rare - no more leaning it up against something and then having the wheels roll out from under it! Overall, it has some nice bells and whistles that make it worth every penny! We really loved testing this stroller, and would have put it up above the 3D Lite if not for the higher price. Downfalls? Well, we found it much easier to fold than to unfold, with the folding process being a bit cumbersome. Also, the wheels weren't quite as smooth gliding as the Graco or Summer options above. The stroller comes in a relatively limited range of colors, but the ones they have are pretty cute - like "blueberry" and "purpleness." #6. Summer Infant 3D One. One of our best overall strollers of the year, this is one of the most convenient and easy to use strollers on the market. Everything is one-hand operation! Fold it up with one hand, adjust the recline with one hand, adjust the footrest with one hand, and adjust the canopy with.... you guessed it, one hand. Super convenient, especially when you're trying to hold your baby in one hand and fold the stroller up and put it in your trunk. The recline has 3 positions, the large canopy has a peek-a-boo window, and it has a carry/shoulder strap built in for when it's folded up. The seat is comfy and it has some nice extra padding in places that many strollers don't, like on the back of the buckle. A couple of more great features are for the parents: a large storage compartment underneath, ergonomically positioned handles, and a rear cup holder and storage pouch. We found the folding really smooth and easy, and didn't require and jerking or shaking around like some others. We also liked that it can stand on its own when folded, using a little kick-stand sort of thing; so you don't need to lock the rear wheels for it to stand upright outside of a store or restaurant. The stroller also feels quite smooth when rolling, but not quite as smooth as the Breaze, and the wheels are very maneuverable. The only real disadvantage here is that you need to rethread the shoulder harness from the back if you need to adjust shoulder strap height. Not a big deal given that you'd probably only do it once every year or two. So only a minor negative, but with some truly excellent positives. Highly recommended! Comes in a few different accent colors, like silver, green, and yellow. Falling down on our list, mostly because it's difficult to find right now. Picking #5 versus #6 was difficult because we were choosing between the Chicco Capri and UppaBaby G-Lite, which both have plenty of positive aspects. As it turns out the Chicco has a few more negative aspects so we've placed the UppaBaby G-Lite before it, but really, it's a toss-up. The G-Lite, as the name suggests, is very lightweight. In fact, it's the lightest weight stroller on our list, coming in at under 9 pounds. Heck, my first baby was heavier than this stroller (ouch)! Because it's so lightweight, it handles like a dream, hopping over curbs, steering with one hand, folding up and being put away, etc. You won't get tired pushing this stroller around all day, and it's super convenient to fold up and carry with the attached handle. It has a convenient and large storage net underneath, and seems very comfortable for the kid. But here are some cons. It has no recline, which means floppy-head syndrome during naps (if they get there), and parents report its wheels being a bit flimsy. The mesh back is nice for air circulation and staying cool on hot summer days, but it's also not very supportive for smaller kids. Also, while there's a great feature that allows the G-Lite to stand on its own, it gets in the way if you attempt to back the stroller up like when going up stairs backward. Overall, this somewhat pricey (about $160-180 depending on colors) stroller has a lot of positives, but certainly more negatives than the Graco or Joovy models. #8. 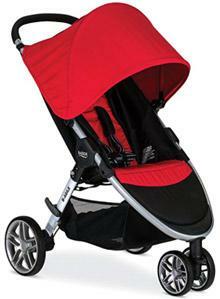 Chicco Capri Lightweight Stroller. The Chicco Capri and UppaBaby came in pretty close to one another in our rankings. Like the G-Lite, the Capri is relatively lightweight, coming in at 11 pounds, just 2 pounds heavier than the G-Lite. But, that's 2 pounds heavier and about $100 cheaper, so keep that in mind. This stroller has a lot of great aspects, including a convenient shoulder strap for carrying, comfortable seat with 5-point harness, some recline functionality, and a canopy. However, parents mention some big negatives. First, they note that the recline function is very limited, and the canopy doesn't extend far enough to block the sun at many angles other than directly above. Also, several parents report that walking behind the stroller can get awkward because if you're over 5'5" you'll find yourself constantly kicking the back wheels, which gets very annoying. Also, there are reports that the crotch strap is in an uncomfortable position and digs into kids' thighs. For a bit more money, we suggest going with the Graco Breaze.